The bright sun of the southern islands shines down on Ooshima's natural landscape. Look around and all you will find is the gentle sea and the quiet shipyards. It is here, in Ooshima, that Olive Bay Hotel is located. Olive Bay Hotel was designed by world renowned architect Kengo Kuma. From the front, the hotel entrance looks like a large picture frame as you walk into the picturesque scenery that awaits you. Inside, you will find design elements by famous designers Eriko Horiki and Minami Tada. The front area is surrounded by glass to let in the warm sunlight and the lobby has a spacious and calming atmosphere. The quiet 「BAR YAMABUKI」 is perfect for spending an adult evening. The set up of the hotel is high-end and luxurious. The refined atmosphere of the guest rooms has been designed by G|A|DESIGN INTERNATIONAL, a company often utilized by the high-end hotels. All rooms come with a floor to ceiling windowed wall and view of the bay. There are only 32 guest rooms in total. Enjoy an exclusive experience. For dinner, we offer dishes prepared with fresh, seasonal ingredients from Ooshima and its surrounding sea as well as homegrown tomatoes and herbs. Enjoy a cuisine that can only be had in Ooshima. Experience a luxurious stay at Olive Bay Hotel as you enjoy activities like cruising and lounging at the private beach. It was very relaxing and satisfied, but the water pressure of the shower was a little weak. 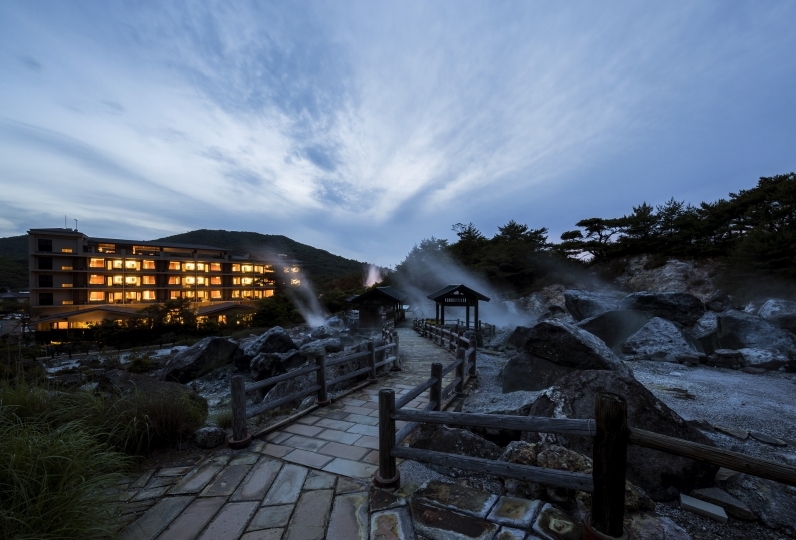 In addition, it was hotel which we want to use when going to Nagasaki. I had a pleasant stay all over. Thank you very much. Especially, I appreciate being able to check in to the room as soon as possible. Both the room and the bath were nice, the location from the room was wonderful, and we were able to refresh both mentally and physically. In addition, I would like to use it. Enjoy a unique cuisine prepared with local and seasonal ingredients from Ooshima and its surrounding ocean at our restaurant 「Olive」, which has a view of the surrounding green forest and sparkling ocean. ※For dinner reservations, please contact us by 17:00 on the day of your dining. Designed by Eriko Horiki, the washi paper represents 「the sun rising over the waves (entrance)」 and 「the moon floating over the waves (wall paper)」. The 「Rinpa」 style elegance and gentle lighting of this atmosphere provides a wonderful space for an adult time. Refresh your body and soul as you look out at the panoramic view from the window. During the day, enjoy the blue skies above, the sparkling water, and the greenery that surrounds you as you feel the gentle breeze and warm sunlight on your skin. 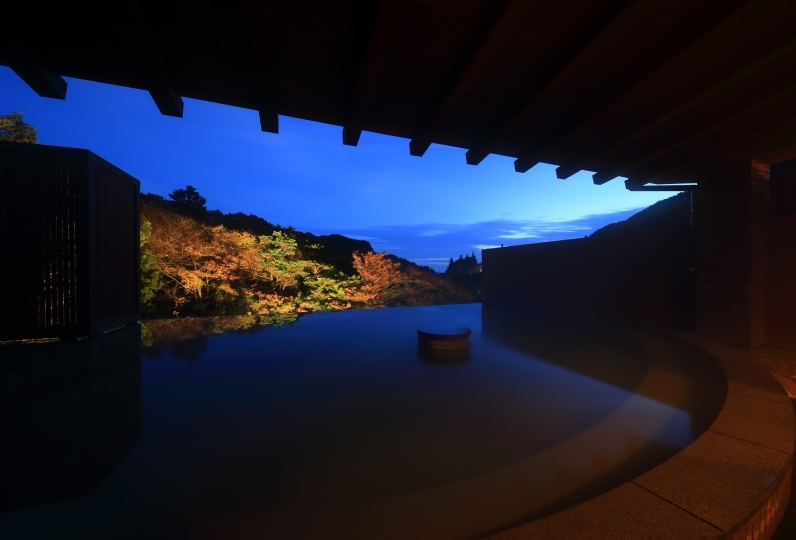 In the evening, the foliage and roses painted at the bottom of the pool come to life in the night light. Heal your soul as you gaze up at the stars in the sky. During the summer, enjoy a dip in the water. Ooshima Bridge closes when wind speeds reach over 20M.